Developed: Mostly built from 1915-1925, between 27th and 33rd Avenues, Lincoln Way to Irving Street. 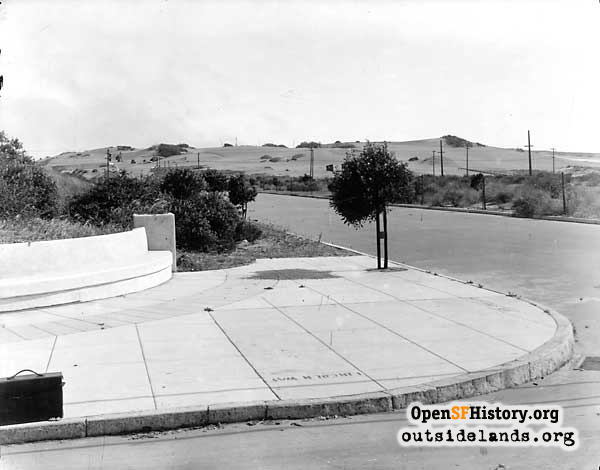 Fernando Nelson placed curved ornamental benches to serve as welcoming entryways on the corner lots of Parkway Terrace facing Lincoln Way. Over the years, some of the property owners have kept the benches in their original state, while others have buried them under lawn hillocks, fenced them in, or adorned them with potted plants. 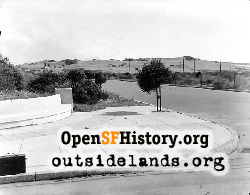 Nelson promoted Parkway Terrace as a residence park with building restrictions and advertised that he would sell the homes only to whites. Some of the properties, especially those bordering Golden Gate Park, are visually striking, with hints of country hunting lodges, tudor cottages, and castle battlements—all perched on small rises from the sidewalk. The lower-priced and humbler offerings of the development are closer to Irving Street. Nelson built himself a house in the development at 2701 Lincoln Way. Page launched 1 July 2002; Updated 26 December 2015.